Hua Hin is a beautiful seaside town, located 200km South of Bangkok on the “Royal Coast” of the Gulf of Thailand, and has all the charm of a Thai village but the sophistication of a Mediterranean resort. 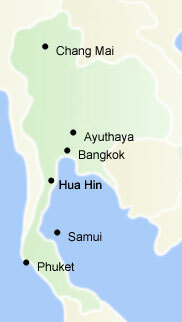 This area is called the Royal Coast because Hua Hin is home to His Majesty the King of Thailand. You can’t get a better seal of approval than that! The town is popular with older couples and families but has plenty to do for all ages and interests, including a lively, but civilized nightlife. Daily train service from Bangkok – 4 hour journey; Flights are also available from Bangkok directly to Hua Hin’s own airport. Or we can arrange for you to be collected, private transfer takes about 3 hours. Cost 2,800 baht. Attractions include – 5km of beaches in various coves with safe swimming, beautiful scenery, eco-tourism in at least two national Parks, wonderful shopping in the famous Hua Hin Night Market, 6 golf courses (with more to come!) and many superb restaurants catering for all styles of cuisine. It’s Truly Paradise!